Time flies! The joyous time of the year is coming, thinking of where to indulge in Christmas dining? 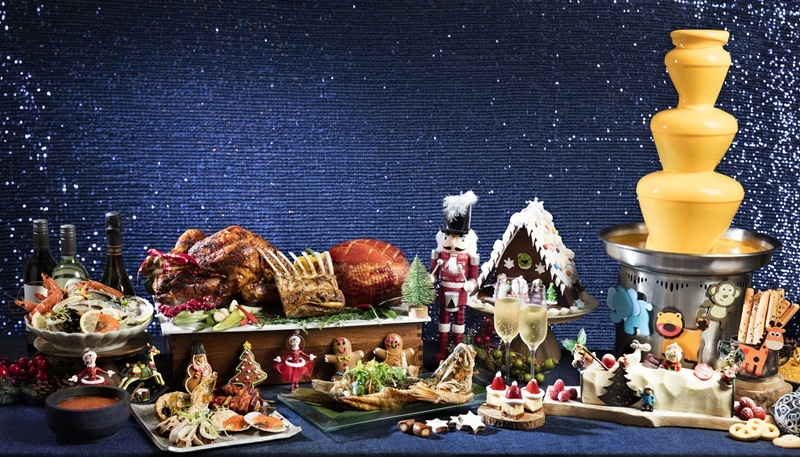 Bask in the lively spirit of Christmas at Mercure Singapore Bugis as Royale welcomes you to Santa’s Christmas Circus Buffet, where the flavourful magic of Christmas comes to life in an enticing festive feast of over 40 scrumptious Yuletide dishes. From a show stopping Truffle Cheese fondue to a Live Outdoor BBQ station firing up smoky grills, let Executive Chef Nicholas Sia plunge your taste buds into a world of flavours while dining in an opulent baroque style-dining hall. 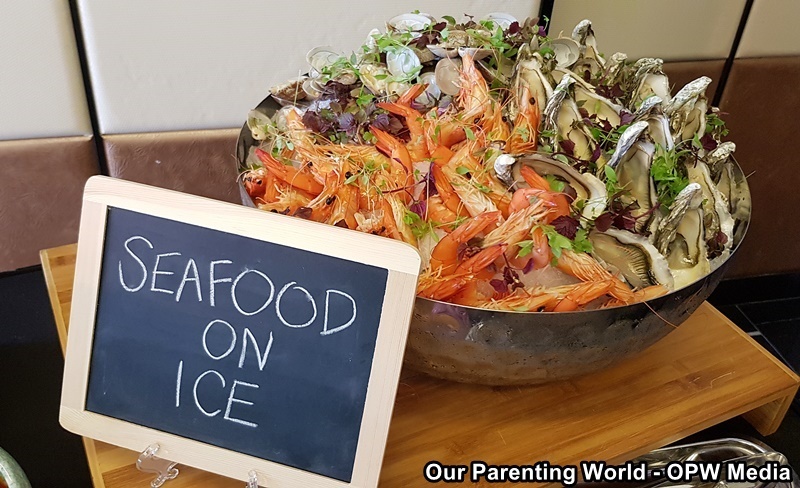 Enjoy this fresh and refreshing Seafood On Ice featuring Live Oyster, Sweet Poached Prawn and Short Neck Clam. At the Craving Station, you can look forward to indulge in sumptuous delights like Baked 7-Spices Turkey with Homemade Chilli sauce, German Pork Knuckle with White Pepper or Pineapple sauce and Baked Honey Cinnamon Gammon Ham with Citrus Sauce. Tuck into the delicious, juicy turkey and enjoy it even more by dipping into its flavourful homemade chilli sauce. This turkey dish returns with an Asian twist to the roasted turkey, where succulent meat is marinated for 24 hours with 7 aromatic Peranakan spices. Best to pair it off with Chef’s specialty Chili Sauce, piquant with garlic. The roasted German pork knuckle, the meat is so tender and savoury. We enjoyed the delightful baked ham that comes with delicious, fruity flavour with the Citrus Sauce. 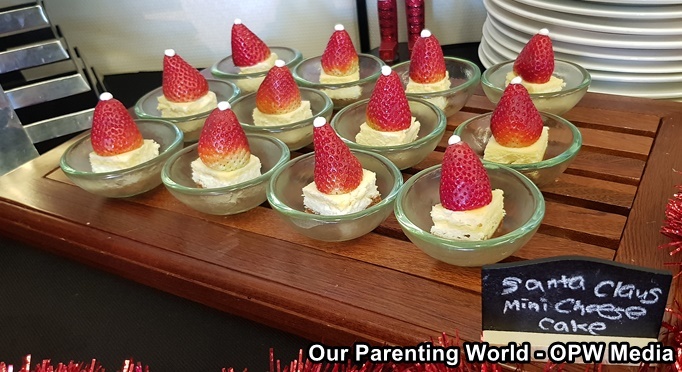 Santa’s Christmas Circus Buffet features a live outdoor BBQ firing up with BBQ fresh-off-the grill and sumptuous delights like Japanese Scallop with Mentaiko Sauce, Tandoori Chicken Kebab with Mushroom, Mini Crayﬁsh with Homemade Spices and Grilled Zucchini. Diners can look forward to enjoy a wide spread of Hot Line Specialties including Truﬄe Cheese Fondue, Black Pepper Pork Ribs, Port Wine Glazed Rack of Lamb, Slow Braised Beef Cheek with Madeira Wine and Oven-Roasted Barramundi on Ratatouille with Champagne Sauce. Look out for Executive Chef Nicholas Sia’s signature Port Wine Glazed Rack of Lamb returns to impress with full-bodied port wine sauce drizzled over a tenderly oven-baked lamb. His latest creation Oven Roasted Barramundi on Ratatouille with Champagne Sauce adds a sparkling touch to the spread, as the thyme and rosemary seasoned fish sits atop a moreish stew of fragrant vegetables with a dash of house made champagne sauce. Don’t we love fondue? The Truffle Cheese Fondue brings its cheesy fountain of happiness on Christmas Eve and Day dinner to send diners instantly into festive mood. Delight in an tempting flow of cheesy goodness infused with aromatic truffle, begging to be soaked up with bread-rolls and chips. To top off a delicious and satisfying meal is to indulge in savory Christmas festive desserts to make your day even merrier! Diners will get to enjoy a parade of festive desserts curated by Royale’s own Pastry Chef Man. 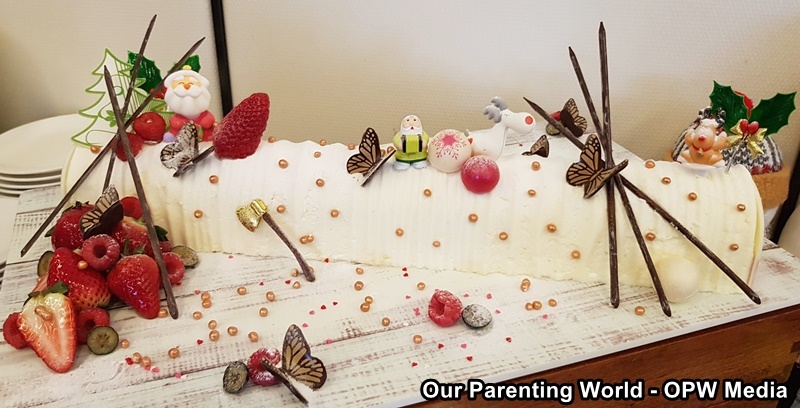 Royale’s Ivory White Chocolate Log Cake boasts a moist vanilla sponge cake lavishly slathered with luscious white chocolate cream filling, presented in a modern edge geometric log shape. In the spirit of a lively Christmas Circus, find delightful treats such as Santa Claus Mini Cheesecake, Festive Tarte, Christmas Mini Cupcakes and more. 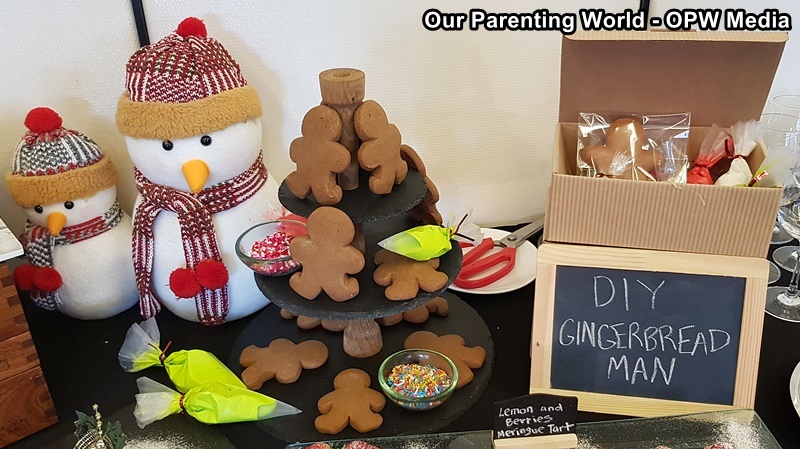 Kids will be excited to know that there is a DIY Gingerbread Man Decorating Station where they can exercise their creativity and imagination to decorate their very own Gingerbread Man at the kids playroom. There are fun-filled activities available at the kids playroom to keep the kids entertained while the adults can enjoy their meal. 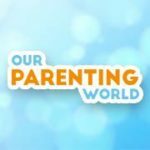 Lunch: $48++ (Adult)/ $24++ (Child 6 – 12 years) Dinner: $68++ (Adult) / $34++ (Child 6 – 12 years) Children under 6 years dine free. Lunch: $68++ (Adult)/ $34++ (Child 6-12 years) Dinner: $88++ (Adult) / $44++ (Child 6 – 12 years) Children under 6 years dine free. Christmas Eve & Day Dinner Highlights: Truffle Cheese Fondue, Tandoori Chicken Kebab, Mini Crawfish with Homemade Spices, Baked Honey Cinnamon Gammon Ham with Citrus Sauce. Ring in the brand New Year at Royale with a gastronomic spread of over 40 taste bud invigorating highlights such as Black Pepper Pork Ribs, Slow Braised Beef Cheek with Madeira Sauce and a Live BBQ station firing up sizzling grilled delights like Tandoori Chicken Kebab and Japanese Scallop with Mentaiko! Sweeten up the celebratory mood with an assembly of handcrafted pastries and tarts and raise your glasses to say toast to 2019 in fabulous taste and style. 31 December & 1 January 2018 Lunch: $68++ (Adult) / $34++ (Child 6 – 12 years) Dinner:$88++ (Adult) / $44++ (Child 6 – 12 years) Children under 6 years dine free.